November 24, 2008. Below are pictures of Mike Zint's recently purchased Grand Finale's mast base and tabernacle. He posted a question on the Forum, and since neither of us can figure out how to post his pictures on the Forum it seemed best to post it here, starting a Technical Page on mast hinges and tabernacles. Here is his question posted Nov 24, 2008 in the Forum's Technical Section. Ron's recent compliation of articles about raising masts on Dolphins was great. Now for a question about the small details. My mast tabernacle has a slot for the bolt to pin the mast in place and the mast itself has two holes for the bolt to pass through. 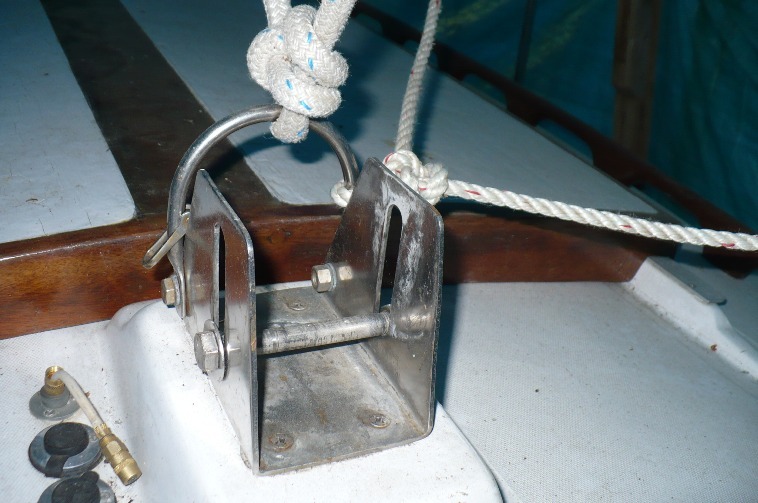 Do you place the bolt through the lower hole in the mast to allow the mast to piviot then pull the pin and allow the mast to drop down and rest against the base plate of the tabernacle then move the bolt to the upper hole location in the mast? Beautiful boats and fair winds! Note the uneven cutoff at the bottom, and what looks like a pressure detent by a washer around the lower hole and maybe what might be a pressure point at the top of the same hole. If anyone has an answer to Mike's question please post it on the Forum as a reply, or email to Ronbreault@dolphin24.org and we will get it up here. 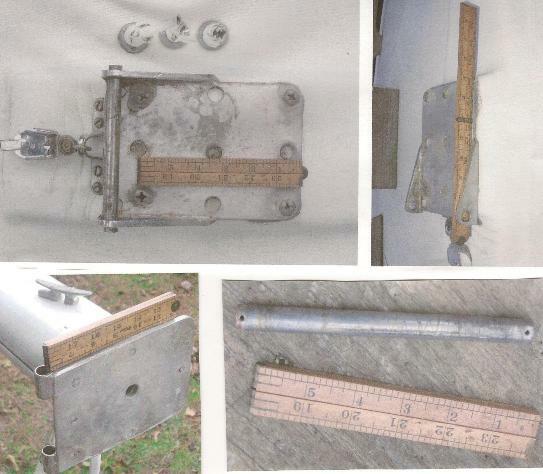 When your webmaster has a chance we will add information on Passage's and Marionette's Mast Hinge plate systems. In removing the old mast tabernacle the top layer of gelcoat and fiberglass came off too. (photo above left). Gotta love 3M 5100! The glass repairs are complete except for the gelcoat. I'm paying the price schedule wise now after taking 10 weeks off in December for much needed back surgery. My back is 20 years better now, but my free time is jammed up playing catch up on clients jobs that were put on hold. It's a shame because the weather here is perfect for working on the boat. 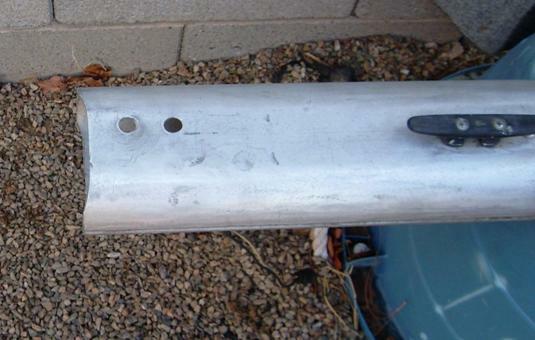 November 29, 2008 Eric Varty, Canopache, Yankee # 188 sent in a picture of his interesting looking mast hinge plate and some comments about Mike's Zint's problem above. Interesting question raised. Attached is pic (poor whit balance photo) of Canopache's step. Quite different arrangement that allows pivot of the mast on one clevis pin and attachment of a second to secure after raising. I do not have a pic of the bottom of the mast and since the boat is in storage in MA and I am in FL won't be able to provide one until spring. I recall that it is flat cut with a hole to exit wiring from the mast somewhat above the nylon plug over which the mast is set. The mast is held down in place and secured to the boat only by the stays and shrouds. I wonder if the mast bottom in question has been shortened. 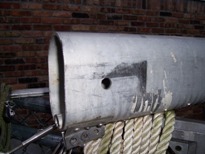 If the bottom were corroded or damage the previous owner may have shortened the mast the distance from center to center of the holes and drilled a new hole further up the mast. The lower hole looks to be worn and the upper in more pristine condition. This would cause the stays and shrouds to be shortened. Are there swaged fittings or mechanical on these parts? If mechanical this would support this idea. 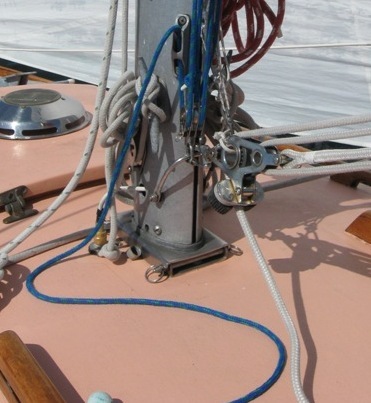 I do not believe that from the pics there appears to be enough clearance for the mast to pivot when attached to the step with the bolt (unless the distance from the bolt center when at the top of the slot in the step is equal to or larger than the diagonal distance from the center of the lower bolt hole on the mast to the bottom foremost or aftermost point on the mast [hard to describe] . November 30, 2008 David Baumer sent in several pictures of his Aeyla Makaira, Yankee # 81's hinged mast plate with comments. They are repeated here below. I am betting the hinging mast step on Yankee Dolphin 81 is original equipment. I took the accompanying photographs to document its condition and construction as I plan her restoration. Note the arrangement in the photograph I took before I bought the boat. 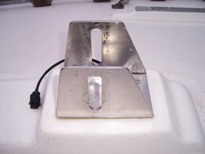 At the base of the mast is a cast aluminum step that is screwed to the top plate of a hinge oriented on the boat to fold aft. The step is screwed to the top plate of the hinge with four stainless flat head machine screws. 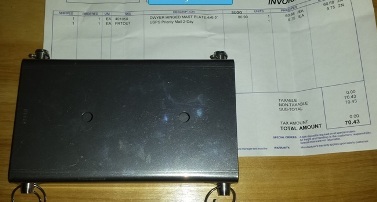 The base plate of the hinge is tapped for the screws. 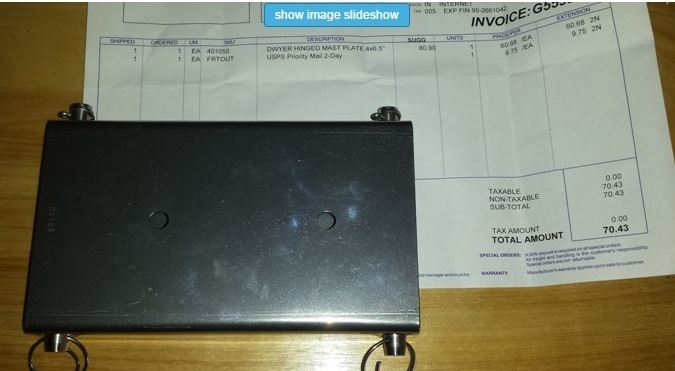 The top plate of the hinge is constructed from a 5” x 7“ stainless steel plate with the corners rounded. The after edge of the plate is ground to a 45 degree angle and two pieces of stainless tubing 1” inch long are welded to it from both sided along the outside edges. This creates the top plate of the hinge. The short lengths of the stainless tubing, I assume, are designed to reduce friction when its time to tap the pin out. Note the corner is broken off next to one of the screws that fasten the step to the hinge, and I am looking for a new step and/or wondering if I can weld to cast aluminum?. YES Between the top plate of the hinge and the cast aluminum mast step is a piece of what looks like thick black Mylar. Securely fastened to the cabin top is the base plate of the hinge. It’s also welded up from ¼” stock. The bottom plate (5” x 7"x 3/8”) is constructed by welding triangular tapered flanges along sides of the after end (4 - ¼” long and 1 ¼” at their widest point). The flanges run past the after end by 3/16 of an inch. The flanges are drilled to accept the ½” pin. The stainless steel pin is ½” in diameter, 6” long, and has holes for cotter pins to keep it in place. I was in the Technical Section looking around and noticed the mast/step section. Cats Paws step is different than any shown. It's 6" long, 4-3/4" tall, and 3-1/2" wide. The slot runs from 1" to 3-1/2" (all inside measurements). Her mast is 3-1/4" by 5", with the hole 2" up from the bottom. Above are a few pictures. 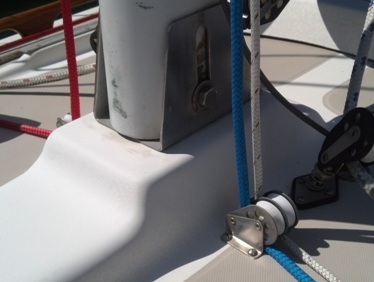 Have any Yankee owners removed the mast step fitting? It is held on by bolts above, of course, but I can't see any access to the underside (in the cabin) where I might get at nuts. It sits on that big fiberglass "hump" and I'm almost wondering if it's in there with lag screws. I want to remove it to place a plate underneath providing attachment points for turning blocks. I'm hesitant to just go unscrewing away, though. On Robin Lee (Yankee #118), I have a bare fibreglass headliner, since any wood veneer which might have once covered it has long-since been removed. 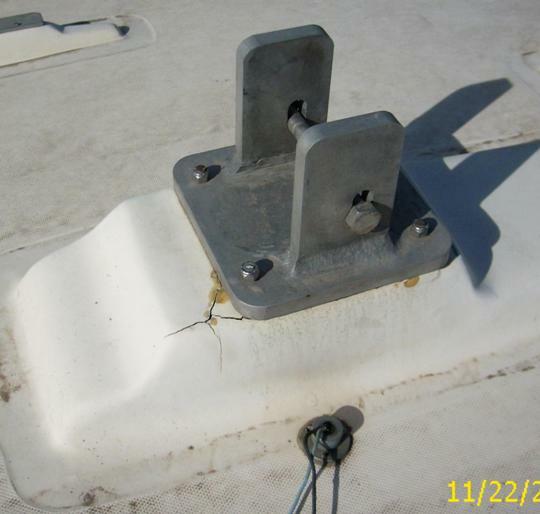 There are no fasteners coming through the liner in the area of the mast step. I think that the "hump" must contain a large chunk of wood, molded into the deck at the time of manufacture. Anything fastened to the "hump" must be attached with lag screws. 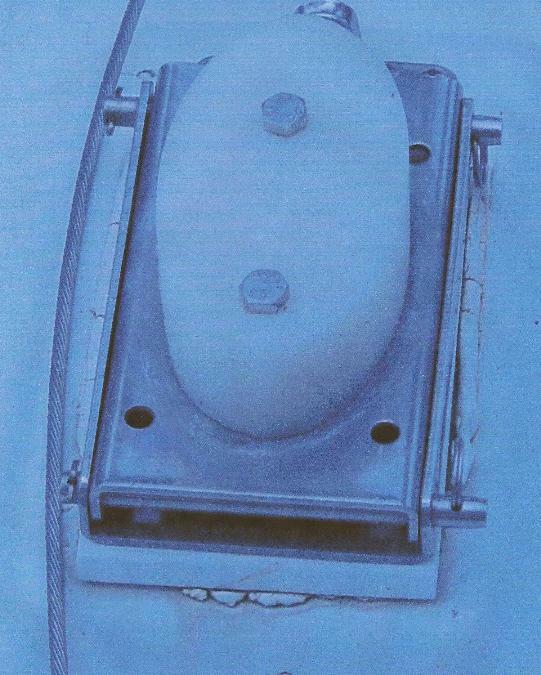 On Robin Lee, there was a large pad eye attached to the aft face of the "hump", which looked to be fastened to it with two bolts. I presume it was original hardware. I say "was", because I naively attached a boom vang to the pad eye, and proceeded to rip it out of the deck. It was attached with two lag screws. That's all I know! Any further knowledge will need to come form a forensic autopsy of a Dolphin-to-be-demolished or a Dolphin-to-be-rebuilt. To see Eric's (kind of) pictures click here to go to the Forum post. We found a good photo of Robin Lee's set up in our archives. April 18, 2011. Jonnie Walker, Yankee #227 confirms the bolts are lag bolts. The mast base plate on Marionette does not 'pin' to the boat's mating maststep plate. Instead, it simply rests on the cross pins, held there only by the downward pressure on the shrouds - like some dinghy masts do. 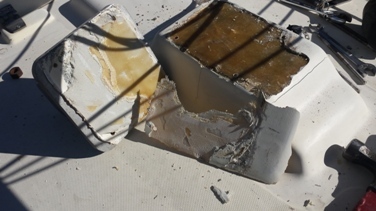 Stan Secora (Jato), a marine architect once told your webmaster that this might be a good idea - if one ever had a rigging failure at sea and the mast went overboard it would not take a significant part of the wooden coach roof with it! 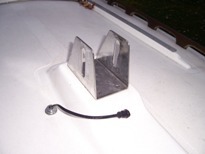 The mast hinge plate/step is attached. I've included a couple of photos. 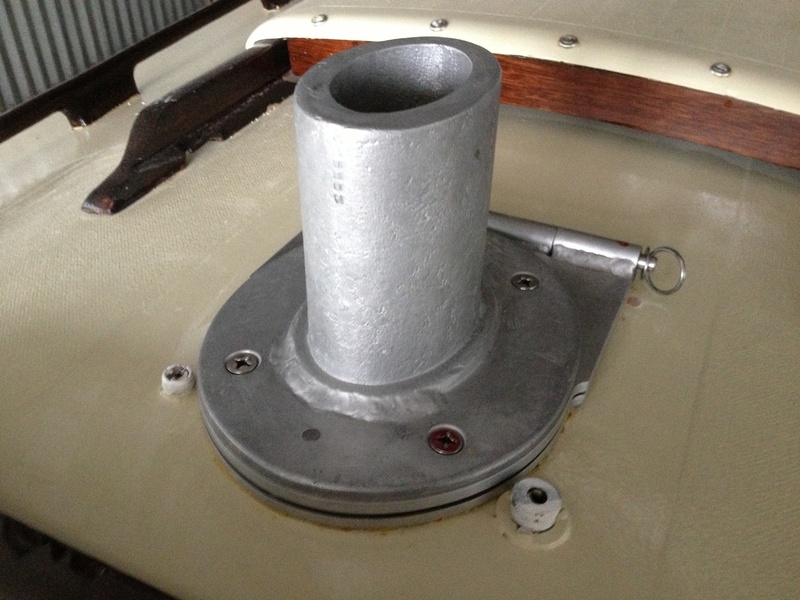 The bottom plate, 1/4 inch aluminum, is bolted to the cabin top and pinned to the top plate which is screw attached to the old mast fitting. This set up is very similar to that of Yankee #81, AEYLA MAKAIRA. The mast fitting was pretty beat up by the boat yard when they were trying to de-rig her in New York. Also, the casting was fairly rough. 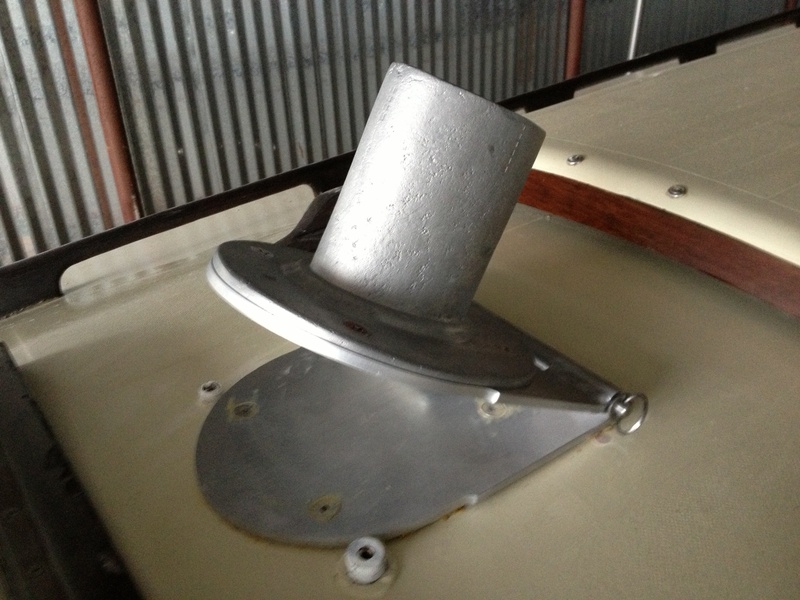 The machine shop did some welding and then built up and faired the base so it would sit flat on the hinge plate.